The state-run Korea Internet & Security Agency is developing bio authentication for mobile banking to commercialize it by late 2018, KISA’s chief researcher said. “We are developing an algorithm for authenticating mobile banking with a combination of a fingerprint, heart rate and (an) electrocardiogram. 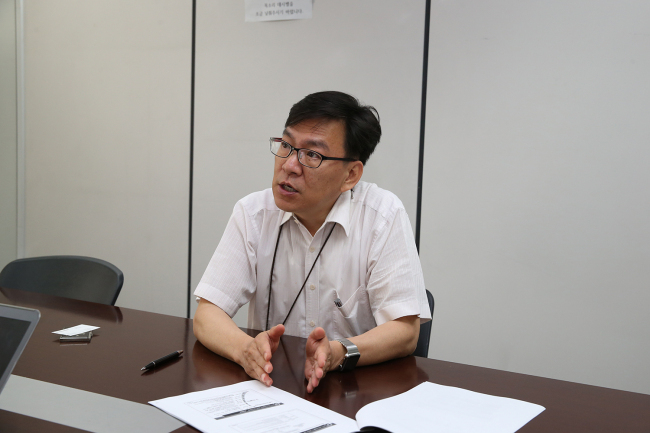 The technology is expected to be much safer than existing biometrics including iris sensors, fingerprint scanners and facial recognition,” Jason Kim, chief of KISA’s security technology dissemination team, told The Korea Herald in a recent interview. Kim is also serving as vice chair of the Korea Association for Biometric Identity Security and chair of the Asian Biometrics Consortium. The biometric authentication reads heart rates and electrocardiograms on a user’s smartwatch, which sends the information to his or her smartphone. The smartphone is then unlocked with the user’s fingerprint which enables the use of mobile banking. This is not the first time heart rate and electrocardiogram authentication is being used to unlock a device. The British bank Halifax and the Royal Bank of Canada are already using electrocardiograms for authentication. “However, the use of the combination of a fingerprint scanner, heart rate and (an) electrocardiogram -- which makes mobile banking much safer -- will be a world first (when it is developed next year),” the security expert said, adding that he will apply for a patent in June. Kim said he is also in talks with some smartphone makers in Korea and China for the adoption of the biometric technologies. “If the discussion goes well, a prototype using the biometric authentication may be available in the market later this year,” Kim said, without elaborating on the names of the firms. The development of the biometrics technology is being led by Kim under the Ministry of Science, ICT and Future Planning with an investment of 1.2 billion won ($1 million). KISA is working in partnership with the National University in Spain, the US Telebiometric Research Center and a small Korean tech company. The project started in June 2016 and will be completed by the end of 2018. Kim said he would present the biometric technologies at the ITU Telecom World event to be held in Busan in September. ITU Telecom World is an annual ICT conference organized by the United Nations International Telecommunication Union. Global firms, including Visa, Mastercard and IBM Watson Research Center, are slated to participate in the conference. The first biometrics technology used in smartphones was unveiled by Korean handset maker Pantech, which adopted a fingerprint scanner for its smartphone Vega LTE-A in 2013. Later that year, Apple adopted a fingerprint scanner for its iPhone 5 for the first time among its smartphones. Last year, Samsung featured the world’s first iris scanner for its premium phablet Galaxy Note 7, which was discontinued due to safety issues. Although Apple and Samsung touted their biometric authentication as the safest, their technologies were fooled by a German hacking collective, Chaos Computer Club, within a few weeks after the phones were launched. “The existing biometric authentication technologies have a long way to go to be popularized due to their technical incompleteness and anxiety among consumers,” Kim said. Market research firm AMI predicted that the biometric technologies market would grow an average of 67 percent annually to reach $34.6 billion by 2020, with adoption in all smart devices, including wearable devices.